No, homeschooling students are NOT required to take the FCAT. 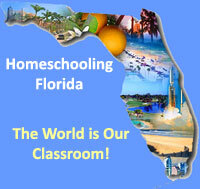 It is one of the choices for an Annual Educational Evaluation, which is required by Florida state homeschool law – Fla. Stat. Ann. § 1002.01. A homeschool student may take the FCAT if a parent desires their homeschool child to take the FCAT. The FCAT will fulfill the Annual Educational Evaluation required by Florida State Law ( Fla. Stat. Ann. § 1002.01 ). It is a state student assessment test which is described in choice numer 2 in the Florida state statute for homeschooling ( Fla. Stat. Ann. § 1002.01 ), to fulfill the required annual educational evaluation. In my opinion the FCAT and the schools’ personnel, are stressing out the students way too much. It is unecessary, and in some schools, it seems to be excessive. Personally, my wife and I, are teaching our children that everything is a “test” to some degree, and we are helping our children to handle stressful situations calmly and collectively. If we ever have our children experience the crazziness of the schools, even just for a few days during a test such as the FCAT, it will not be until they are at least 15 years old, just for the experience. ← Annual Educational Evaluation Letter & Standardized Testing – Which One?